They look like my favourite oatmeal cookies. Yummilicious! Thanks, Angie. I put way more oats in my oatmeal cookies, but the small amount in these really adds a certain something. What a great way to adapt Bernideen's recipe. YUM! Seven years of blogging is an amazing feat! It wasn't until I started blogging that I realized how much work it takes to put together a post. I work full-time (gotta earn money to support my tea habit!) so a weekly post is all I can manage too. Terra incognita! Totally new cookie for me. (Who knew?) Sounds promising, though soft only appeals to me if it’s chewie. Don’t think these are chewy, so maybe I prefer your crisp incarnation. And Butter World sounds like Oz. Think you should open a branch next to Willie Wonka’s chocolate factory. Sugar and grease. Yum-yum. Thanks, Sully. Yes, these were chewy (I call it crun-chewy when there are the crispy edges too), so I edited the post to include that bit of info. A branch of Butter World next to the Chocolate Factory would be great, could make whole families happy simultaneously. Thank you for your visit today and I am SO happy I stopped in here. Thanks to you and Bernideen for the recipe. You and I both miss our mothers dearly, especially around the holidays. When I was young, mother made a cake each Christmas with orange slice candy!!! It also had pecans and dates. It almost looked like stained glass when sliced. Many folks do not care for the orange slice candy (too gritty) so your candied orange peel is great to know about! Happy New Year! Are you on facebook?? Well, making your candied orange peel is on my weekend agenda so maybe I'll have to go the extra mile and try these too! Yes, I think I will! They look great. Jeanie, thanks. I hope you like them as much as we do. And making the peel is really kind of fun! I enjoy an oatmeal cookie so that makes this a double delight. I appreciated your tip on placing the dough in the fridge for a bit to soften the oat, never thought of that. Your dishes are quite pretty. I have so enjoyed following along with you and look forward to seeing what you have for us in the New Year. Thank you, Debbie! I hope you'll find lots of things to like here in the coming year. Wishing you a wonderful 2017. These look great and remind me of the candied orange peel my dad made one Christmas! Thanks, Amy! Sounds like you could have a candied orange peel tradition in your family! version too! Thanks for sharing and linking! Oh, Karen, I love it! Meant to be! I didn't make the peel in time to put it in my fruitcake, I just put zest in it this time. Hi Jean, thank you for stopping by for a visit. I'm working today on my post for Monday. Your cookies sound "delightful", and how nice to get inspiration from our friend, Bernideen. I'm like you, and will make do rather than run to the store. Your dishes are beautiful! Wish I could share a cookie and cup of tea with you. Happy New Year, Jean! This is a perfect addition to my recipe collection. 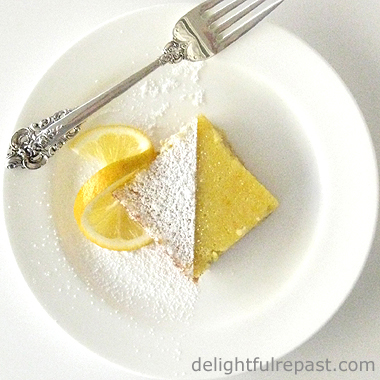 I have several lemon cookie recipes but not orange. I really enjoy citrus and I've been wanting to make my own candied orange peel. Do you think it would work if it were homemade? Thank you for sharing I can't wait to make the recipe. Kitty, thank you. I have just the trio of this pattern and another trio of it in pink. Come on over, you can choose your color! Marisa, yes, just follow the link to my homemade candied orange peel. That's what I used in the cookies. It was wonderful! I'm with you, I really enjoy citrus! Looking over the ingredients I can tell I would LOVE these cookies. I received a cute little cookie dish like yours for Christmas. It matches two of my tea pots. Thank you for the great recipe, Jean! Thanks, Karen! I'm glad you like it. I hope you'll make them soon to enjoy with your tea. I love finding new blogs, yours is wonderful. Your cookies look delicious and I hope to make them soon. Happy New Year! Thank you, Gerlinde! And you should check out my Hildesheimer Pumpernickel Kekse (it's kind of a funny story). I'll take mine either way, soft or crunchy! :) Just love cookies!! Thanks for sharing with SYC. I will check out your Hildesheimer Pumpernikel Kekse because my German home is only 30 minutes from Hildesheim. I'm with you, Jann -- either way! Thanks so much! Hugs. Oh good, Gerlinde! I'll be interested in your comments. My American friend, who gave me the recipe, got it from his German friend, who had converted it from her metric to his US measurements (which I didn't need), and I think some things got lost in translation! Your recipe for Hildesheimer Pumpernickel Cookies looks good. I asked the German Mr. Google and there is an old fashioned cookie by that name . Pumpernickel is a dense German bread made from coarsely ground whole-grain. Nobody seems to know why these cookies have that name . There are several German recipes for this cookies. Thanks so much, Gerlinde! I don't speak German at all (except a few food words!). I think I'll make them spicier next time, but we did love those crunchy little cookies. Now we're cooking! I think you and I could cook together....you look like a perceiver here...adlibbing along the way! They do look excellent. I prefer a crisp cookie any way! Jean, your cookies look wonderful and so pretty too sitting on your china. They sound mighty tasty and would be a treat with a nice hot cup of tea. Wishing you and your loved ones a Happy and Healthy New Year! Susan, yes, I probably learned my recipe developing skills from my "P" mother! Sandi, thank you! I've got the kettle on now! Wishing you and yours a wonderful 2017. These sound just amazing, Jean - and I loved your comment about butter on my post. I couldn't live without it, either! By the way, I just saw a two-tiered plate like yours at Kensington Palace! I kind of wanted to buy it, but knew it would be hard to pack. Happy new year! I hope it's wonderful, flavorful, and adventure-filled! Thanks, David. And I hate to tell you this, but these tiered stands come apart for easy packing and storage! But I have one I keep assembled all the time because I have the space for it AND I like to have one "ready to go" at all times (never know when a tea party might just happen!). German baking recipes in general are not very sweet or spicy. That suits me fine, Gerlinde. I always cut back on the sugar in everything. I don't like things too sweet. Hi, Jane, learned quite a bit about baking chemistry in your post, so I am glad that you didn't have certain ingredients, that the original recipe called for, handy ;-). I realized lately that baking is so much about knowing these chemical processes to get it right. Looking forward to your recipes in the new year! I hope I am able to try a lot of them out. Wishing you and your loved ones a happy and healthy New Year 2017! Christina, thank you so much! I do try to show the "whys" and "hows" along with the recipes and hope you'll find lots more recipes to try here. Wishing you and yours a wonderful 2017! Your cookies look wonderful, Jean! I love your tea stand too! I must admit I'm easily distracted when baking as well, but I think everything looks lovely. Thank you for sharing with us at Hearth and Soul. Happy New Year! Thank you, April! That particular tea stand is one of Bernideen's. It's a beauty! These biscuits look so yummy, perfect with a cup of tea I would say. Thank you for sharing with the #DreamTeam. 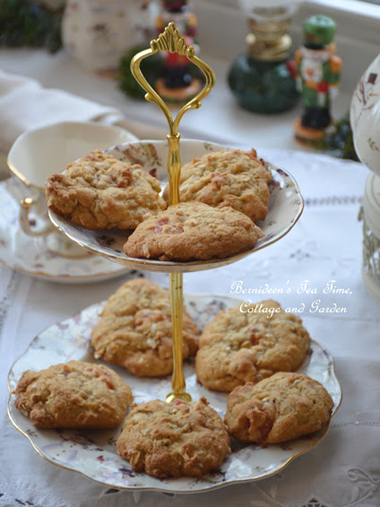 This will be a perfect cookie for my afternoon tea, which I am about to have, wish I had that cookie right now! Thanks so much for sharing your awesome post with us at Full Plate Thursday and best wishes for 2017! Miz Helen, thank you so much. Wish I could join you for your tea, accompanied by something tasty, I'm sure! So much fun to see the recipe from a previous post used here, dear Jean. 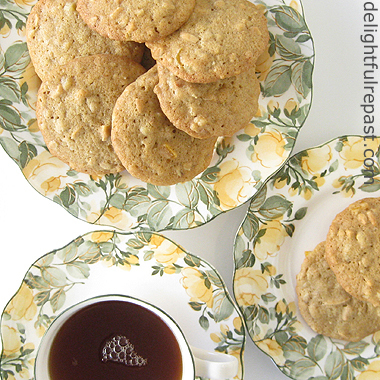 The chew from the orange and oats must be splendid; especially paired with tea. Your images evoke calm and contemplation making this cold, rainy Northern California day feel much warmer. p.s. Santa brought me that coveted Panettone mold for Christmas! Brooks, thank you. I'm going to be cultivating more "calm and contemplation" in the new year. And I'm so glad I have a panettone post to look forward to now! Dear Janice, I hope you've enjoyed your break. And there'll be time enough to try these recipes when you're through with your fast. Wishing you love, joy, peace, and a wonderful 2017. Helena, thank you. I've checked out a number of the links and will be visiting more tomorrow. Yum! May give these a go! Kate, thanks, I hope you will! Thanks, Marilyn! And your social media shares are sooooo appreciated! Happy New Year to you, Jean and Mr Delightful!! Thanks, Tony! No Scottish ancestry that I know of, but one of my great uncles from the Lake District seems to have crossed the border for his bride, so my mother had a delightful Aunt Lizzie from Scotland. Wishing you and your girls a wonderful 2017! Jean, Love your photo of the cookies. I am not brave enough to make substitutions in recipes. Thanks for sharing your recipe. Happy New Year 2017. Sylvia D.
These look absolutely delicious! Third egg or not... Thanks for sharing at Monday Social. Sylvia, thank you! And that's okay if you don't make substitutions. If you have a good recipe, why mess with it? I just can't help myself! :D Wishing you a wonderful 2017. Thanks, Judith. I love messing about in the kitchen! Thanks so much for stopping by!! These sound really good!! I will have to try them!! I really like chewy on the inside, crisp on the outside cookies. I like the science behind the ingredients discussion...very interesting. There has to be a science to getting my favorite cookie texture. Happy New Year! A perfect treat for tea! I think they need a drizzle of dark chocolate, but that's because that's a favorite flavor combo for me. Thanks so much for linking to Tuesday Cuppa Tea! Vee, thank you! I appreciate your telling me what you think is interesting to read. I like to give additional details besides just the recipes. Thanks, Ruth! Yes, a drizzle of dark chocolate would be excellent. I'm not in the mood for chocolate very often, but when I am I like it in combination with one of three things: coffee, mint or orange -- classic combinations all. These look so pretty---thanks for sharing at the Homemaking Party! Sarah, thank you! I do like things to be pretty, even though taste is most important! 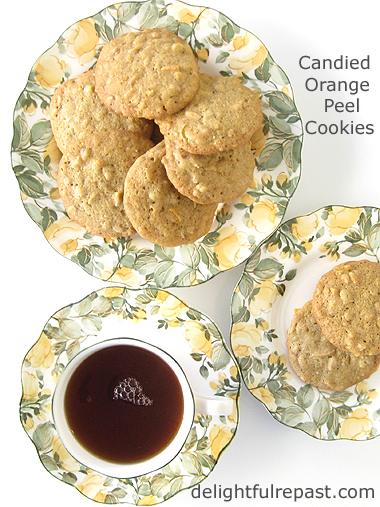 candied orange peel cookies looks delicious jean. I like it, Thanks for sharing with Hearth and soul blog hop pinning and tweeting. Thanks so much, Swathi. Much appreciated! Annette, thank you. I think they're my new favorite cookie! Jean these cookies look so yummy and now is the perfect time to make them. Oranges are ripe and delicious now. I'll pin this one for my girl who loves to bake. Mary, thank you. If you all like them as much as we do, your girls will want to make them all the time! I made these for Christmas as I had candied orange peel left over from another recipe. These cookies were a big hit and I will be making them again. Thank you so much, Kathy! I'm so glad they were a hit. Wish I had a couple of them right now to go with my tea!